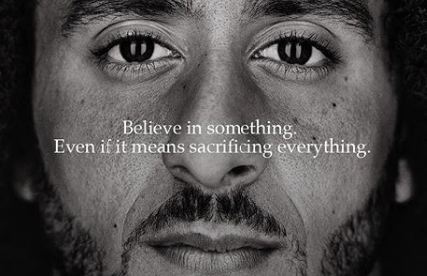 Still Image via Instagram @Kapernick7 Former NFL player Colin Kaepernick has been working with Nike since 2011. It all began with an innocuous act. Colin Kaepernick sat on the bench during the national anthem for the first two preseason games for the San Francisco 49ers in August 2017. The national media didn’t notice until the next week during the third preseason game on August 26. The 49ers after the game released a statement confirming that this action was intentional. Kaepernick explained afterwards that he kneeled to protest the oppression of people of color and ongoing police brutality. Two days after, Kaepernick met with the media again and elaborated on his protest. “…This stand wasn’t for me. This is because I’m seeing things happen to people that don’t have a voice, people that don’t have a platform to talk and have their voices heard and effect change. Nate Boyer, a Green Beret veteran and former Seattle Seahawks long snapper reached out to Kaepernick and suggested the alteration in his protest to show respect. That is key. It unequivocally disproves every person who shouts on social media, on talk radio and on message boards that what Kaepernick is unpatriotic or detracting from the military. This country is founded on two documents both of which show that what Kaepernick is doing is wholly American. Kaepernick is reminding us through his stance that protest is our right, that all men are created equal and deserve their life, their liberty and their opportunity to pursue happiness. Not just millionaire NFL owners. Not just for media personalities who are looking to make a name by criticizing Kaepernick. Everyone is created equally under the law of the land. Look at the footage from body cameras and dashboard cameras and without a shred of a doubt, the police in those instances took judgment into their hands. We are not as far away from the tumultuous 1960s where men like Martin Luther King gave their last full measure for the cause of civil rights as media pundits and those with white-washing agendas would have you believe. The Little Rock Nine, the first children in Arkansas to attend a desegregated school after Brown v Board of Education in 1954 are only 76 years old. In historical terms, it’s less than the blink of an eye. Kaepernick kneels for those who died oppressed. He kneels for those who died in a system designed to oppress those whose only crime was living while not white in America. God forbid the actions of Kaepernick force people to think about what they may have done to perpetuate the systemic racism and institutions that hold people of color down in this country. Those who say that Nike is purely an opportunistic capitalist enterprise using the moment to make money are petulant. I saw people burning their Nike apparel, and in fact one gentleman burned his apparel while still wearing it. Nike making him the face of their 30-year campaign is bold and to be commended. It represents a self-aware company who desires to be on the right side of history. They recognize that the people who buy their products want to put their money in companies who share their values. According to Sports Illustrated, as of December 2017, Kaepernick has donated $900,000 of the $1 million he pledged to donate to various charities. These range from youth initiatives, anti-police brutality movements, community reform and even climate change awareness. He put his money where his mouth and actions were. If those who detract from his protests care about veterans and patriotism so much, why not step up? It’s not about veterans or respect or patriotism. It’s hypocrisy. When did you stand up for what you believe in? When did you sacrifice your livelihood for a cause? He believed in something, even if it meant giving up everything for it. That something is the conversation about police brutality, racism and what we need to do as a society to give equal opportunity for everyone, not just those with money, resources or fair skin. Let’s reciprocate that courage Kaepernick showed by continuing this conversation with civility even if it is hard and makes people uncomfortable.